Your beach vacation to the Bahamas should be relaxing, rejuvenating and most importantly, fun! The hardest decision you’ll have to make is which beach to visit. Considering almost every beach in the Bahamas is picturesque, these carefully curated beaches go beyond the beach to bring you amenities and activities, as well as stunning views. Whether you want a beach that’s family-friendly, secluded or close to a reef for diving, the Bahamas has you covered. Cable Beach is the most well-known beach in Nassau. 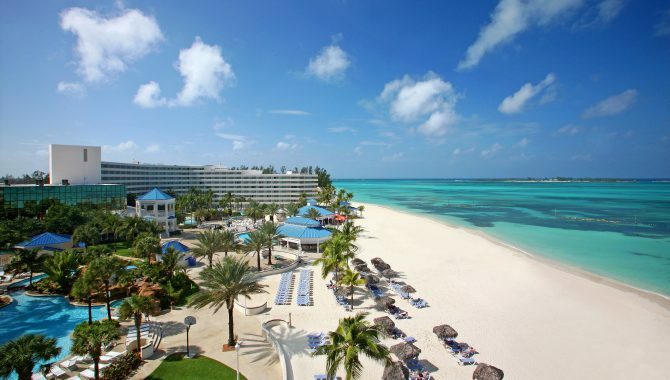 You’ll need to stay at one of the beachside resorts like Baha Mar, Meliá Nassau Beach – All Inclusive or Marley Resort and Spa to enjoy this white-sand beach where umbrellas and sandcastles abound. And if you’re not staying at a resort on Cable Beach, ask about day passes—many resorts sell passes for access to their beach, pool and beach amenities like chairs or cabanas. Otherwise, access the public portion of the beach on Goodman’s Bay, just be extra careful swimming as no lifeguard is standing by. Both families and couples enjoy Cable Beach as the water is calm and there are accommodations for every type of traveler. 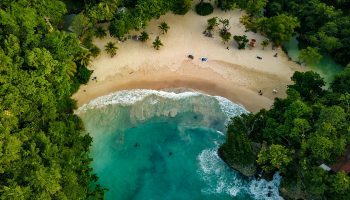 Tour, rental companies and souvenir vendors service the area, so whether you want to snorkel inshore, charter a boat to a nearby cay or pick up a gift, you’ll be able to do it all with your toes still in the sand. Spend your day at Love Beach if you love snorkeling. Only 20 minutes from downtown Nassau, this beach has multiple acres of protected coral just asking for admiration right off the shore. Amenities are far and few between but Love Beach is worth the extra preparation, it’s quiet and often deserted. Colorful Compass Point Beach Resort huts dot the shore, adding a fun twist on the otherwise secluded beach. Fortunately, it does have a bar—Nirvana Beach Bar serves food and drinks made to order. If you plan to get a post-beach bite, head to nearby Dino’s Gourmet Conch Salad Restaurant—known for some of the best tropical conch salad on the island. Don’t forget to look for sea glass, Love Beach has plenty! 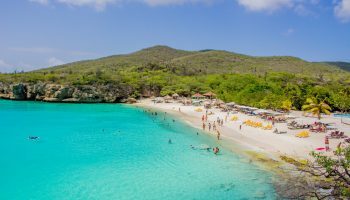 Cabbage Beach is tucked away on Paradise Island with transparent turquoise waters and white sand. 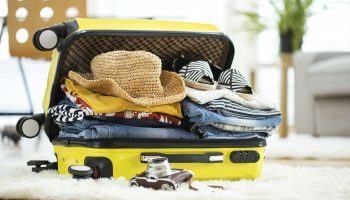 It is so beautiful that both world-famous resorts like Atlantis Paradise Island Resort and Paradise Island Beach Club, along with some celebrity residences line this beach. The water is rougher than other beaches with consistently strong rip currents, but that doesn’t keep vacationers away. Cabbage Beach is equally as popular as Cable Beach, just often less crowded. Sunbathing, land activities and water activities like jet skiing and boat charters are this beach’s main draw. Keep your eyes peeled for vendors offering an “all you can drink” deal and enjoy endless tropical drinks out of a coconut while you sunbathe. Visit this beach if you’re looking for a quiet escape away from the city, vendors and resorts. 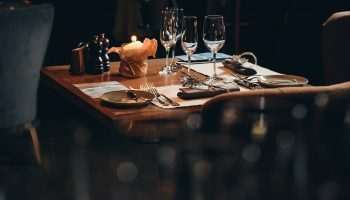 You’ll need to bring your own provisions, but with the peaceful atmosphere, it’s a worthy trade-off. Xanadu beach gives you a secluded slice of sand just minutes from Freeport. Expect to see few visitors, if any at all, and crystal clear, calm water. You’ll notice retro remains of the once famed, Hotel Xanadu where big names like Frank Sinatra, Dean Martin and Lucille Ball used to visit. While you won’t see celebrities or vendors, Xanadu Beach remains a hidden gem in Freeport. 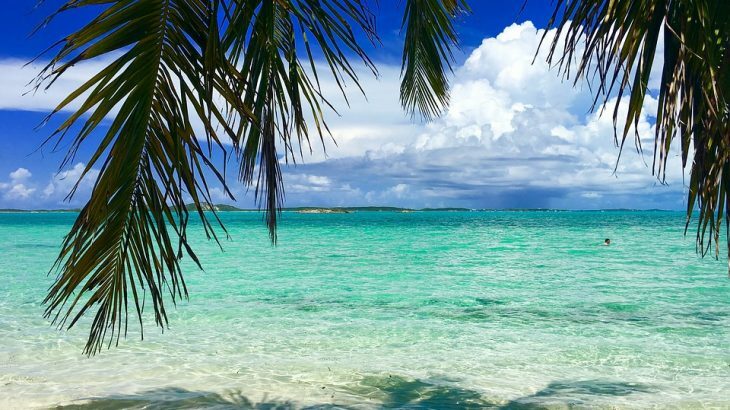 Set foot on Grand Bahama’s “welcome mat” and enjoy the shallow, turquoise waters that made the perfect backdrop for a “Pirates of the Caribbean” movie. Gold Rock Beach is part of Lucayan National Park. The sandy shore is a tranquil place to wind down after exploring the park and its underwater cave system, the largest in the world. Shallow depths that extend far out into the ocean at low tide have made this beach famous and the perfect environment for children or wading. After walking the boardwalk across the street from the caves, you’ll approach white sand and seclusion. Aside from hungry raccoons, you’re unlikely to see many visitors on this beach. There are restrooms nearby and a shop with snacks, but it’s wise to bring your own supplies. Just be sure to hide your snacks from the raccoons, they’ve been known to take off with a beach bag or two. Casuarina Pines line this large beach that offers calm water and privacy on the Caribbean side of Eleuthera. Most days the beach is deserted, but it does fill up from time to time. Pack drinks and snacks and follow the dirt road all the way there. Plan on swimming in the shallow, translucent water or snorkeling by the rocks on either end of the beach. Sand dollars, stingrays and sea stars inhabit this stretch of water so be sure to shuffle your feet and keep an eye out for the local inhabitants. This beach’s name is pretty self explanatory. 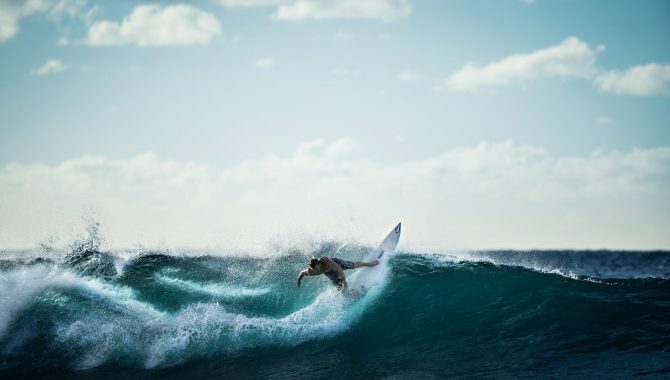 Most people don’t think “surf” when they think of the Bahamas, but Eleuthera has a phenomenal surf spot hidden just south of Gregory Town. Whether you surf or not, this beach is a must-see. Grab your gear and hop in or watch the riveting sport from soft white sand. The best waves roll in September through March, but Surfer’s Beach is a popular spot year round. If you don’t have your own board just head to Rebecca’s Beach Shop and rent one from Surfer Pete. Ask a local about the “Bone Yard” before surfing here, this rock formation is dangerous and should be avoided. Harbour Island draws vacationers year round just to see it’s three-mile stretch of pink-hued sand. 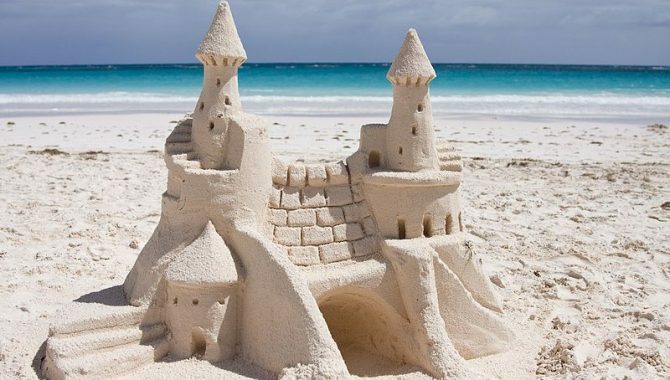 The sand is always cool enough to walk on and known for being extremely soft. However, there’s much more to this small island than colorful sand. The world-famous Current Cut Dive, snorkeling and swimming on outlying reefs and shopping in Dunmore Town keep visitors busy off the beach. Expect locals to wave as you walk by and fine hospitality wherever you stay—Brilanders are known to be extra friendly. Visitors often rent bicycles or golf carts to get around. Overall, Pink Sand Beach is calm, quiet and perfect for lounging outside your beach hotel or swimming. Tahiti Beach is the perfect spot to get that iconic island photo everyone wants on vacation. Located on the edge of Elbow Cay, you can only reach this secluded beach by foot or boat. You’ll want to visit during low tide when you can walk far out into the ocean and the water still isn’t past your waist. Low tides make sand dollars, starfish and shells easy to find—enjoyable for both adults and children. It’s likely you’ll have the beach to yourself—even on its busiest days, Tahiti Beach only has a handful of visitors. 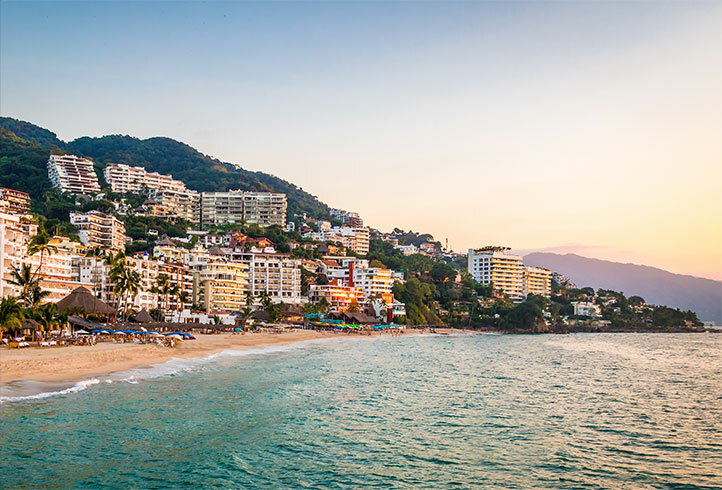 If you’re lucky, the floating bar and restaurant will be anchored during your stay, or better yet, pack your own meals and enjoy a beach picnic. Many visitors simply can’t leave after just one visit and anchor their boat right off shore or stay at one of the nearby hotels. 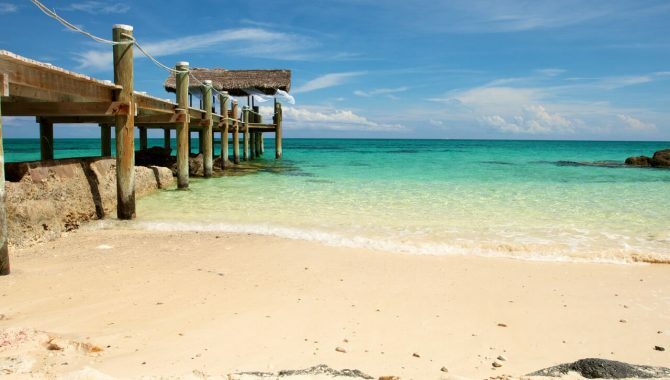 When there’s clear turquoise water as far as the eye can see, you’ve reached Treasure Cay Beach. Photos really don’t do this beach justice. Palm trees, mangrove alcoves and uninhabited swathes of sand stretch for three miles, making it easy to find a spot all to yourself, on the off chance there are other beachgoers. Treasure Cay Resort and Marina is a popular accommodation option and hangout spot on Treasure Cay Beach, in addition to other bars and restaurants close by. If you want some adventure on Abaco Island venture off the beach to the nearby blue hole. Pull right off Queen’s Highway next to Alice Town Beach and you’ll land on manicured Radio Beach—the perfect spot for a comfortable family outing. As the only beach on Bimini with public facilities, it’s the most popular, but you can usually find your own peaceful spot of sand. 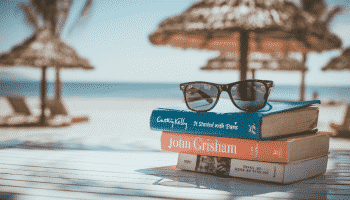 Whether you take a leisurely beach walk and lookout for the Gallant Lady freighter marooned just off shore or cozy up in the shade with a good book, the sound of gentle waves will soothe your soul. Stay at Hilton at Resorts World Bimini and make a day trip to the beach or Big John’s Hotel if you want to be just across the street. 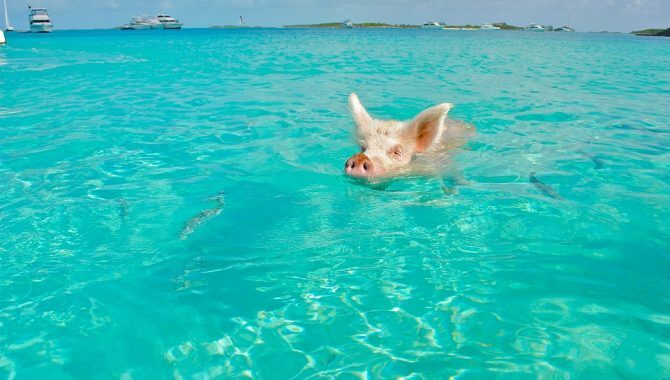 Minimal research on the Bahamas yields odd images of vacationers swimming in the water, not with fish, but full-grown pigs! Pink snouts and oinks greet you as you anchor at Pig Beach on Big Major Cay. This cay exists uninhabited—other than the pigs—and is only reachable by boat. 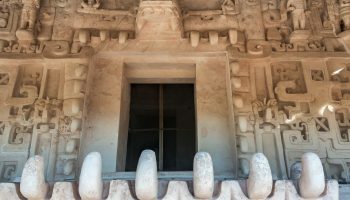 Just how the pigs arrived here is a still a mystery, but there’s no shortage of folkloric explanations. Be sure to bring a waterproof camera on this outing as it’s unlikely you’ll see swimming pigs surrounded by turquoise water more than once in your lifetime. Visit the pigs through a boat tour with Exuma Water Tours or Harbour Safaris, a waverunner tour through Exuma Water Sports or rent your own boat through Exuma Vacation. 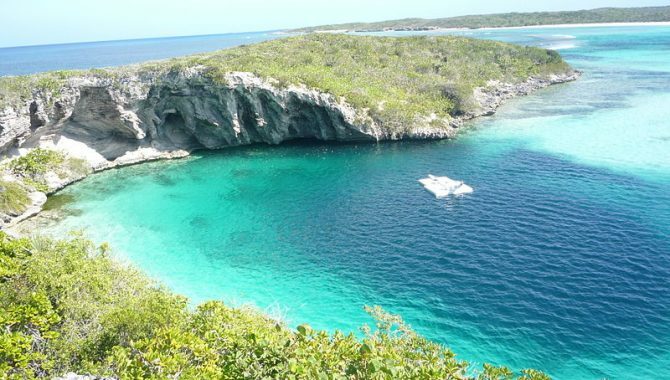 Thunderball Grotto, famous from the James Bond movie “Thunderball” and swimming with nurse sharks is also in the Exumas so be sure to ask your tour guide if you want to see all three attractions in the same day. Glittering water in every shade of turquoise and blue draws divers, snorkelers, swimmers and beachgoers from all over to Dean’s Blue Hole—the second deepest salt water blue hole known to man. This daunting blue hole offers otherworldly views and an eerie sense of mystery. Prepare for total seclusion—getting to Dean’s Blue Hole requires a bumpy, unmarked drive on Long Island and not many visitors make the journey. Surrounded by a crescent of rocks on three sides and glistening white beach on the fourth, the blue hole doesn’t even start until you descend more than 60 feet below the surface. Expect to see tarpon, sea turtles, octopus, seahorses and a variety of fish around the edges. Many climb the cliff and jump off into the hole, but it’s only recommended for strong swimmers, as there is frequently a current and the sand around the edges of the hole crumbles leaving you with no footing. The shallower area off the beach is perfect for non-swimmers. Freedivers hungry to break a record meet here annually for the Vertical Blue Freediving Competition.